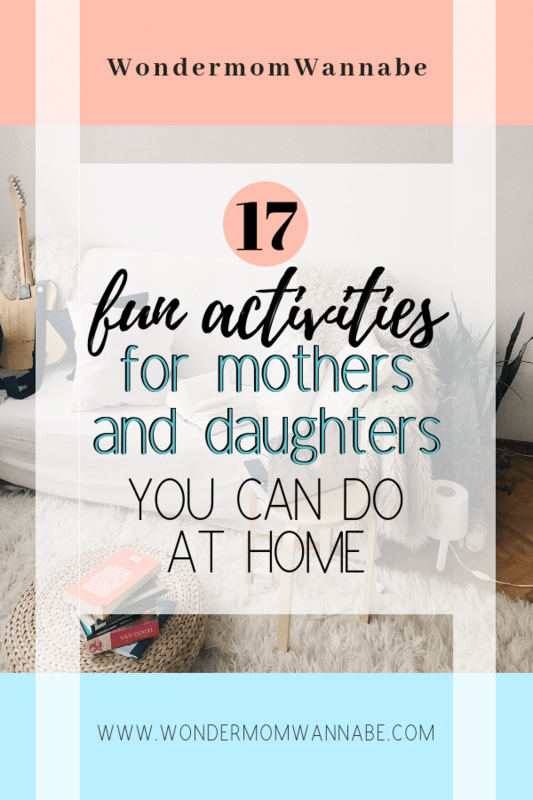 Even when you’re low on funds or the weather is awful, there are plenty of fun mother daughter activities to do at home. In fact, some of the best mother daughter bonding activities can ONLY be done at home. With five kids, it takes a deliberate effort to carve out time to spend with each of my children. I make the effort because I think it’s important for each of my children to feel valued. Plus, I like getting to see a different side of them and learn more about their personalities. Spending quality time with my kids also gives me an opportunity to reinforce values and introduce them to new things. My time with my daughters is spent very differently than my time with my sons. They have different interests, different personalities, and different relationships with me. These are the activities I enjoy doing with my daughters at home. In the Wiki Game, you and your opponent agree on two words. The goal is to be the first person to get to the second word from the first word in Wikipedia by only clicking links within Wikipedia. When my kids told me about this game, it seemed impossible. However, you quickly figure out tricks that make the game go quickly. A “slow” game might take up to 10 minutes. Even girls who think video games are just for boys have fun playing some of them. Some of our favorites are ones that get us moving. Just Dance is a ton of fun and so are Wii Sports. Pull out your smartphone or tablet and take selfies together. If you’re like most moms, you are always the person behind the camera, which means there aren’t a lot of photos of you floating around. Your daughter will love this opportunity to capture some rare photos of you. Plus, you’ll have mementos of your day together. From a very young age, many girls are fascinated by make up. It’s a different form of playing dress-up and many of us never outgrow our fascination with it. My younger daughter loves when we do makeovers on one another. Usually the goal is to make the other person look as ridiculous as possible. With my teen daughter, I actually learn makeup techniques that evolved sometime after I stopped trying to learn them back in the 90’s. Whether you do each other’s nails or chat as you each do your own, mani/pedis are fun to do together. They are an easy and inexpensive way to pamper yourselves. Skip the expensive day spa and pamper yourself at home. Coat your locks in a hot oil or conditioning treatment. Slather your face in a revitalizing facial mask. Coat your hands in a nourishing hand treatment. One of my most dreaded chores is cleaning out my closet. It just seems like so much work when I think about pulling out everything, sorting it, purging, and figuring out what items I need to purchase to fill in gaps. It becomes a fun project when I have some help from my daughter and we turn it into a fashion show. I end up with new ideas to use old items, she ends up with a few hand-me-downs, and I end up purging more than I would on my own because my daughter acts as my fashion voice of reason. It’s just as fun to have her star in a fashion show from her closet. Her closet ends up more organized, she often finds items she forgot she had, and I’m usually persuaded to buy her an accessory or clothing item that really will round out a great outfit. My family plays a lot of board games. These are some of our favorite 2-player games to play together. The great thing about card games is that a simple deck of cards provides so many entertainment options. Dating Divas has an amazing list of 2-player card games arranged by difficulty level. A friend of mine has an annual holiday tradition where she chooses a random craft project from Pinterest and has each member of the family recreate it. Sometimes she buys materials in advance, but usually the participants have to forage the house and make do with the materials they can find. The more basic the craft (think crafts for kids) and the fewer materials you have available, the more fun this game is. Your daughter may surprise you with her ingenuity. If you already have a skill like sewing, cake decorating, or painting, spend a few hours teaching the skill to your daughter. You might discover an untapped talent. She might develop a new appreciation for you and your talents. If you aren’t crafty by nature, it can be fun to learn a new skill alongside your daughter. Pull up instructional videos on YouTube to learn how to crochet, take great photos, or create papier-mâché sculptures. Even something as simple as coloring together can be both relaxing and fun. I love going through family photos with my daughter. It’s such a fun way to relive old memories. Give your trip down memory lane purpose and choose photos to include in a scrapbook, collage, or a slideshow video. 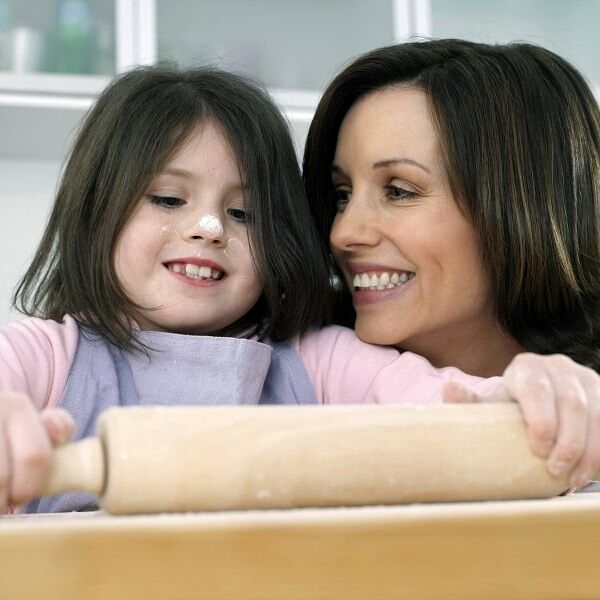 Cooking is a life skill all of our children will need as adults. It’s easy to teach this skill to our children by working in the kitchen with them. 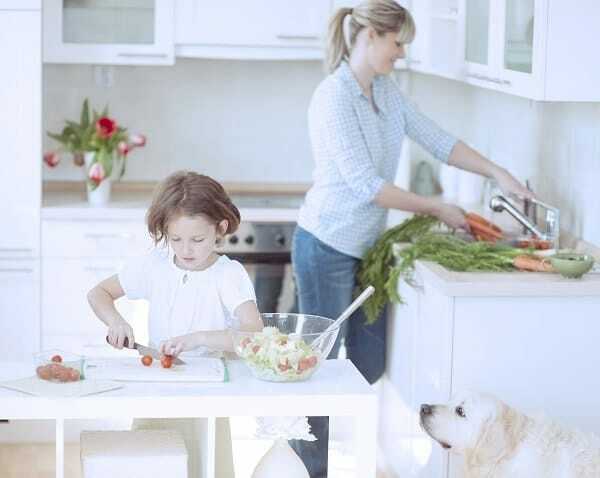 Brainstorm possible dishes with your daughter as you inventory the refrigerator and pantry. You’ll have plenty of opportunities in the process of making a meal to explain how to choose flavors and ingredients that work well together, how to choose a cooking method, and how to clean as you cook for safety reasons and to save clean-up time afterwards. My kids love baking but I hate having a kitchen full of tempting desserts and baked goods. So, when we bake together, I use the opportunity to encourage kindness and generosity in my children by suggesting we bake for others. Along the same lines as baking for a friend or neighbor, a fun mother daughter project is to put together. If you keep a stockpile of household supplies like I do, this is easy to do without leaving the house. 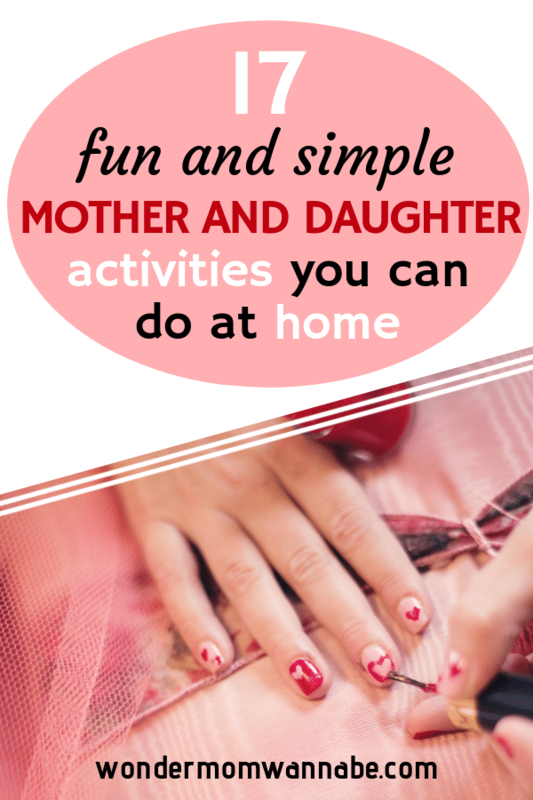 Actually, if it’s just you and your daughter, these won’t be actual “battles.” However, they are fun opportunities to help your daughter see a playful side of you. Dance battles are fun because they let you show off your awesome running man and robot moves. Theoretically, your age should give you an advantage in rap battles since you’ve read more books and have a larger vocabulary. But if you can’t bring yourself to rap or dance, you can always settle for a lip sync battle which only involves silently singing along with a song you love. For blackout poetry you just need a magazine, newspaper or catalog and something to write with (ideally a black marker). Then, you mark out words with the goal of leaving words that create a poem. My mom and I want a interesting thing to do. We have done most of the things up above and we’re kind of bored today, we would like you to think of anything cool, fun and out of the box. But we can’t go to the beach because we live in Ct. I’m eight years old and I just want to make sure that you don’t give me anything that you can only do as a teen. Thank you! My mom and I never have time together but now that we do, it’s hard to find things we both like. I can’t do any ice cream things because of my sports and when we bake its over soon. I wish we had something to do that’s of the screens but lasts for a long time. im always so bored and my mom always works in the basement, my sisters at preschool and dads at works any suggestions for home alone? Do like writing or drawing? Fill a journal or sketchbook with some of your creativity. You can print off free coloring sheets from all over the internet (from easy to adult difficulty) which is always a relaxing activity. My youngest daughter created a newspaper. She puts in family news and makes up puzzles and comics plus funny classified ads. Is that something you might enjoy? Also, there are lots of solitaire games you can play with cards or you can try building houses out of cards. Make up contests for yourself — see how long you can hold a headstand, see how many jumping jacks you can do in a minute, etc. When I was little I used to make up dance routines to songs or alternate lyrics. Do any of these sound interesting to you? If not, let me know some of the things you already do that you enjoy and I’ll try to come up with more ideas. I get bored sometimes at home .what could I do with my mom. Was there anything from the list above that sounded the least bit interesting? If not, what types of things do you enjoy? If you can point me in a general direction of the types of activities you like, I can help brainstorm some more ideas. Yeah same, I feel the same way. Sometimes we will go shopping, watch a tv show or bake together but those don’t last very long so sometimes I want to do something else with her. My kids are on spring break this week. Today we made banana bread and played badminton. Either of those work for you and your mom? Was there anything else in the post that appealed to you? If not, what types of things do you normally enjoy? I’ll try to brainstorm some more ideas. It’s good that you have started to do stuff with your children, I would suggest, as you have done something outdoorsy, to do something like a movie night, watch a marathon of Disney Films! Something that every mom and daughter would enjoy! Great suggestion! My younger daughter loves having Phineas & Ferb marathons (her current favorite show). It’s fun to see what tickles her funny bone. My brothers are at sports, and me and my mom are left alone. We don’t know what to do, because we have already done most of the things listed up above. I am eight years old, and I hope you can give us something to do!